Chinese characters are an interesting part of visiting China. Bill, my stepbrother, gave me a marvelous book called I Can Read That - A Traveler's Introduction to Chinese Characters. It teaches approximately 70 characters, and I will show you some of them. What's so interesting are the insights they give you into the Chinese mind. 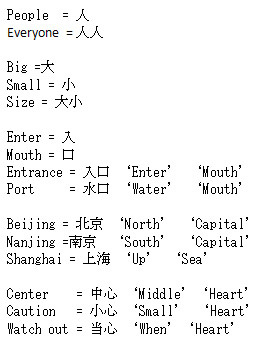 An example is the Chinese figures for the word "China." It's actually spelled "Middle Country," because it considers itself to be the center of the universe. Likewise, the European/American world is given the Chinese character for West. So, if a restaurant serves both Chinese and Western foods, it proudly announces in big Chinese characters: MIDDLE WEST FOOD. This confused me at first, being born and raised in the mid-west part of the United States. I began looking for pictures of scrambled eggs and bacon or meatloaf on their menu. "Chinese" food in America has been greatly modified for American tastes. You just don't get the heads and the feet and the broken bones of various domestic animals found in the food served here. And the "Western" dishes have been modified here in China for Chinese tastes, too. The "Ox Tail Soup" was half bones. The Western Steak was real American beef (shipped here from America,) but it was smothered in some strange Chinese mushroom sauce. Grilled meat served alone is unthinkable in China. The People's Republic of China uses the simplified Chinese characters developed by Mao, which makes it a lot easier for Westerners like me to read them. The rest of the world, like Taiwan, uses the traditional Chinese system, much more difficult to figure out. The items on the left are actual Chinese characters and their definitions. The literal English translation is to the right. 'Turn on' 'Turn off' = Switch. Beijing = 'Bei' 'Jing' = 'Northern' 'Capital'. Nanjing = 'Nan' 'Jing' = 'Southern' 'Capital'. Shanghai = 'Shang' 'Hai' = 'Up' 'Sea' or above the sea. 'Public' 'Use' 'Electric' 'Speech' = Public telephone. 'Fire' 'Vehicle' = train. In the 19 century, trains looked like fire vehicles to the frightened Chinese. 'Steam' 'Vehicle' = car. I guess Stanley Steamers were the first cars in China. "Middle" "Heart" = Center, as in center of the body. "Small" "Heart" = Caution, be careful. "When" "Heart" = Watch Out, warning. "Small" "Heart" "Fire" "Vehicle" = Caution, Train Crossing. WARNING! Watch out for falling objects, like bamboo poles as big as trees. They will shish kebab you in a heartbeat. WARNING! It's easy to fall off this thing, you idiot. Remember "Small" "Heart" = Caution, be careful, from the above list? Well, you see the Chinese figure for heart on three of these signs (arrows.) It is the second character from the left on the bottom. The symbol for heart is the one with a backwards "J". The Chinese character in front of it is not "Small." It is something like "Exploding" or "Big" "Heart" to indicate literally "Watch Out" or Warning, a whole lot stronger than "Caution!" Play it safe in China, if you can. Finally, let's go out in the real world of China and find another sign to translate. Can you guess what the sign below says? are ‘Up’ ‘Down’ ‘Electric’ ‘Stairs’ or escalator. Remember 'Up' from 'Up''Sea' or Shanghai. Same character. Remember 'Electric' in Public Telephone. Again, same character. 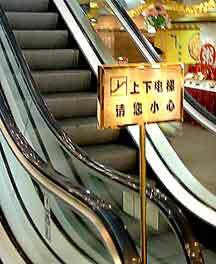 So my guess is this sign says, "Escalator - Use caution when getting on and off." What's your guess? You have learned a little about China and Chinese characters. It gives you a great insight into the Chinese culture and allows you to learn more about the Chinese characters themselves. This will make getting around China a whole lot easier and lot more fun. It definitely impresses the Chinese, if you can write a few things in Chinese characters.